Wolves ran out 30-23 winners to add the trophy to the ones they won with their England Handball National Cup and Super-8 title successes. Ben Tyler and Jacob Maxted top scored for Wolves with six goals apiece. Liam Welsby beat the keeper five times, and skipper Stephen Clarke beat the keeper four times. Livingston’s Chris White headed the scoring charts for the match with eight goals. Reflecting on a great season for Wolves, Head Coach Bill Baillie said: “We have had a special season this year. This is not only because of the treble but also the emergence of our youth programme, under-18 boys and under-18 girls and our unbeaten under-16 boys. “The achievement this year will only help them to drive to be a part of that success. The players will tell you that it is not easy to be a part of the Wolves as the demands at training reflect our winning culture. This has not only helped us win trophies but developed players for the national team. “Ultimately the praise should go to the players who time and again this season have produced in every game. “Saturday's match, although a test event was treated the same way by the squad and we were able to see off a spirited Livingston team. 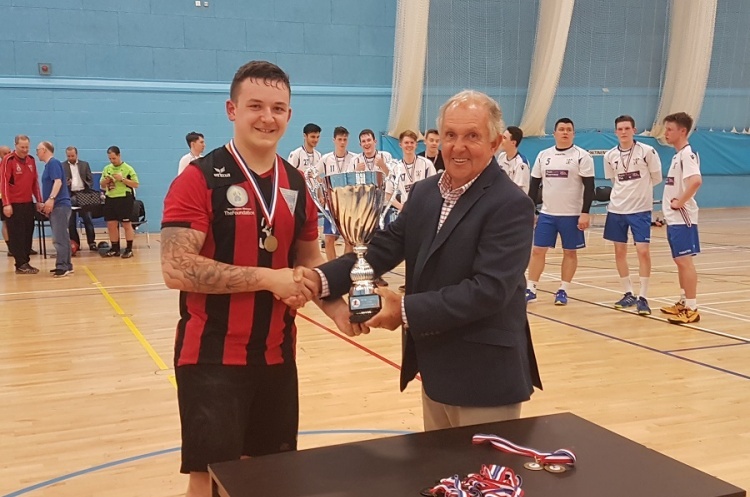 Wolves Chair Kristian Marsh said: “Being the first team to win 'The Treble', our fifth England Handball National Cup win on the run, and our second league and cup double is a tremendous achievement for the club. “It reflects all the hard work the players and those that support the club have put in throughout the season. “It also demonstrates our success in developing players. Whether they have been with us for some time, have come through from our own junior programme or have joined us from elsewhere.